Oh gosh, I've put this off for way too long... I was originally going to publish this back in January, and then in March, and then I thought it would work well to publish it for Christmas in July, and then... you get the picture. But hey, I've finally buckled down and finished it off. That's right, the story of what I did at Christmas is coming some 10 months later. Enjoy! Actually, once again for Christmas I didn't travel to any exotic locations. In fact, it's probably going to continue that way for the foreseeable future, because I don't have any trips planned at all right now, including this upcoming Christmas. I haven't had any trips since then, either. It's kind of sad, but maybe in a year or two I'll get to go somewhere. Goodness knows I love to travel! 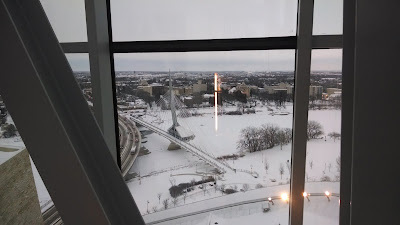 So, instead of traveling far away, I went back home to Canada to get my yearly snow and cold fix, and while I was there I spent a couple of days in Winnipeg. I've always loved going to Winnipeg. It's probably the place I've visited the most, so the city has quite a bit of nostalgia value for me. Yes, there are plenty of reasons to complain about it (like the roads; no planning whatsoever! ), but I still look at it through rose-coloured glasses. For the past several years a new museum had been under construction in Winnipeg: the Canadian Museum for Human Rights. Last September (the one in 2014) the museum finally opened, and I decided that while I was in town, I was going to check it out. The museum in all its glory. The Canadian Museum for Human Rights is located in the heart of downtown Winnipeg, at The Forks. It's quite a large building, and is visible from a long way off. 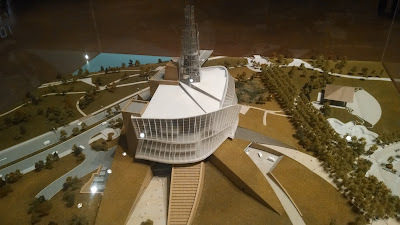 The building's design is very stylish and modern, with curved glass walls enveloping the core of the building where a blunted glass spire stands, housing an observation deck: the Tower of Hope. The entrance to the building is actually slightly below ground level, with a gently sloping path to funnel you though the main doors. Once inside, you are greeted by the box office and complementary coat check on the right, and the entrance to the museum proper straight ahead and slightly to the left. Peeking out from just beyond the coat check you can catch a glimpse of the gift shop and on-site bistro (it's fancy and expensive, just as a warning). After purchasing tickets (good for the whole day, so you can come and go as you please), it is time to pass through the entrance and begin the long climb. And it is a long climb. There are some 7 floors to the building, not counting the Tower, all of which are significantly taller than the standard office building height, and they're all connected by long, winding ramps. To be fair, there is an elevator as well, though it isn't located at the beginning of every floor. You can get a pretty good idea of just how long the ramps are by taking a look at the floor plan. There is a clear path through the museum, as each floor has one entrance and one exit (aside from the elevator) located at opposite ends of the floor from each other. In order to get to the next floor, you must walk through all of the current floor's galleries. It makes for a nice sense of progression as you ascend, though it can also feel a bit limiting since it forces you to explore the museum on its terms, not your own. One of my favourite parts of this museum is the huge influence of modern technology. Nearly all of the galleries incorporate some form of technology; everything from the standard touchscreen information kiosks to super-fancy motion-tracking projectors that allow for an extra level of interactivity. For a tech nerd like myself, it was glorious. Each floor has a theme that all of its galleries are based around. The first floor is simply an entryway, with a nice diorama of the museum and surrounding area. 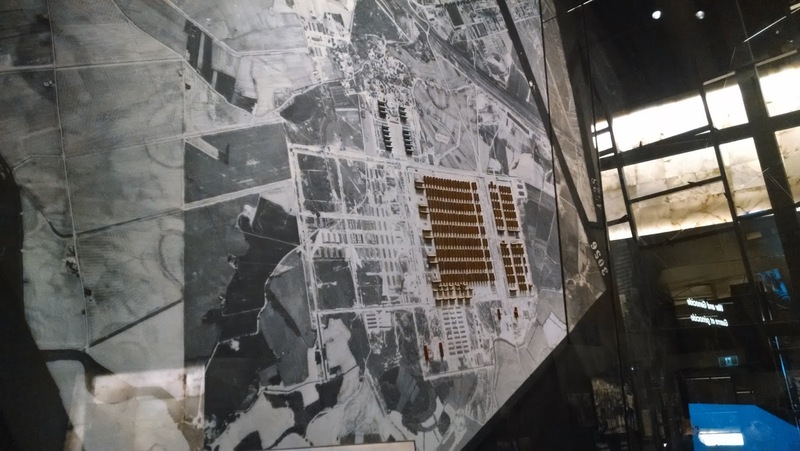 It's possible that there could be temporary displays set up there due to the large open area outside the elevators, but there was nothing of the sort when I visited. This is also the floor with the coat check, bistro, and gift shop. 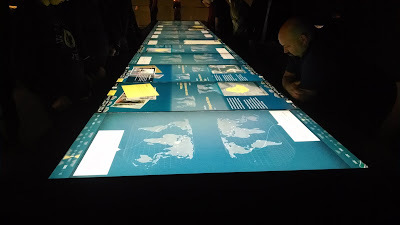 The second floor serves as a simple introduction to the concept of human rights in general, presented in a few different ways. 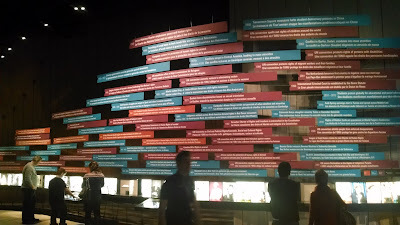 Along one of the walls is a stylized timeline of the major events and advances in the history of human rights across the world, all the way from pre-history to the current years. I suspect one of the reasons it was presented in this fashion was to show how the frequency of human rights advances has dramatically increased as we near the modern age. 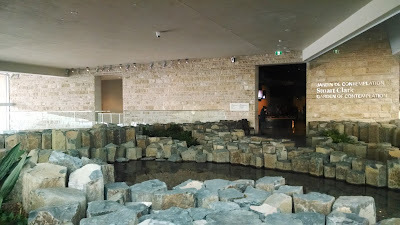 The other gallery from this floor that stood out to me was the Indigenous Perspectives video. It isn't presented in a theater like most videos are, but instead inside a small, circular room. It takes advantage of the circular design by projecting the video onto all sides at once, creating a seamless 360 degree video. It's a neat effect. I also appreciated the fact that there was a person translating the video into sign language at the bottom of the display. I may not be deaf myself, but it would just seem wrong if a human rights museum didn't take the needs of those people into account. Floor 2: That timeline's even colour-coded! Convenient, right? The third floor is about human rights in Canada specifically. It covers the different laws that have been passed over the years to improve human rights in the country. This is also the floor that has the relaxing rock garden and calm pools. It's very visually appealing, with the rocks standing at slightly different heights and the pools of water filled to the point of almost overflowing. There's even a ramp you can walk down to be at eye level with the surface of the rippleless water. Floor 3: This is one of the few technology-free areas in the museum. The fourth floor covers the Holocaust and other global tragedies, as well as the global and Canadian actions that were taken to address these and other human rights issues. The section on the Holocaust isn't extremely large, but that doesn't make it any less chilling. I've actually been to the Holocaust Memorial Museum in Washington D.C. (which donated some of the items in the gallery, I believe), and this gallery has a very similar feel to it. This is probably the most technology-focused floor, with the massive touch screens you can see below as well as some simple games that can be played involving fancy projectors. This floor can easily take the longest time to get through of any, especially with the movies that play. Floor 4: This is Auschwitz, the famous concentration camp, as viewed from a spy plane. The fifth floor is about modern issues in human rights. Unfortunately, I failed to take any pictures on this floor, and my memory is failing me a bit now. If I remember correctly, the topics covered included things like LGBT rights and possibly the Middle East conflict. The sixth floor is a space for showing temporary exhibits. 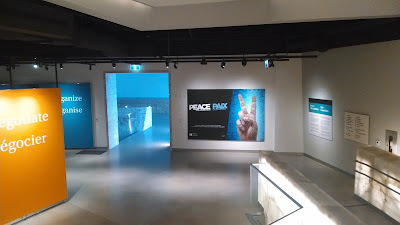 It's supposed to rotate every so often, but I believe that it's currently the same exhibit that was there when I visited: Peace. We really didn't spend much time here though, since we were really getting tired after walking up and around six floors. Floor 6: This was the exhibit when I visited, "Peace". The seventh floor is quite small since it's high enough in the building that the ceiling has started to taper. The display there is about how change is possible. Mostly though, the floor serves as an entrance to the Tower of Hope. You can either take an elevator up (not the same one that accesses the other floors), or you can climb the stairs. It's not a short staircase though; you can see in the pictures that the Tower goes quite a bit higher than the rest of the building. The observation deck is actually pretty far from the top of the tower, but it still gives you quite the view of the city. I have a fear of heights, but it was totally worth it. Tower of Hope: I love Winnipeg in the winter. That's actually a restaurant on that bridge. 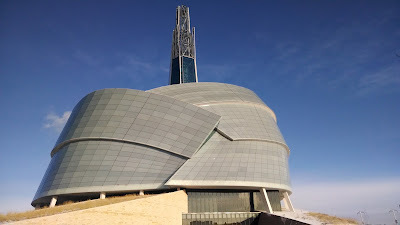 That was it for our visit to the museum, but certainly not all for our day trip to Winnipeg. 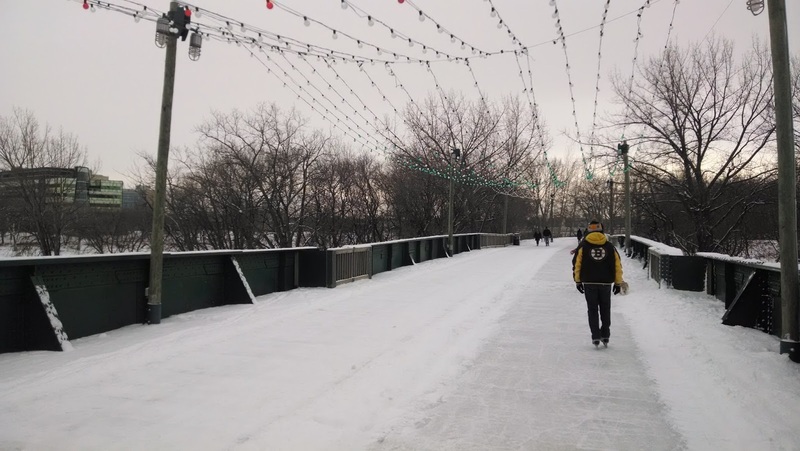 We were already at The Forks for the museum, so we decided to do all the things you typically do at The Forks: eating and skating. Our favourite restaurant there is The Original Pancake House which, as I'm sure you can guess, is kind of like IHOP or Perkins, but local to Winnipeg (and unrelated to the American chain with the same name). Skating at The Forks (ice skating, obviously) is pretty awesome, to be honest. It's all outdoors, so it only lasts from late December at the earliest until early March at the latest. There are two places to skate: on the river, or on the land. The river freezes over and crews shovel off the snow, making for one of the world's longest skating rinks, some 8 km at its longest. The land skating is what I personally find the coolest. There are several ice rinks set up at various places, but if you want to get between them, you don't have to take your skates off; you can skate straight there. They flood the walking trails that are on land! It's so cool! More than a kilometer of these fun little trails! I like it. They actually freeze the walking trails, turning them into skating paths. Alright, I'll confess that this next bit didn't actually happen on the day that we went to the museum. It was more of a spontaneous thing a few days later, the night before I was going to fly back to school. It could easily be arranged to be all in the same trip though, so I'll include it. Plus, it's one of the things that was on my bucket list for doing in Winnipeg: actually seeing a Winnipeg Jets game live! Now, for those of you who aren't in the know, the Jets are a hockey team in the NHL, and are the pride and joy of Winnipeg. The city lost the team shortly after I was born, so for most of my life I only knew the pain of the team being gone. But then in 2011, a miracle occurred and the team was reborn! Transplanted from Atlanta, actually. People loved it so much, they bought all the tickets for the next several years. And so, tickets to see the Jets at home in Winnipeg are some of the most expensive in the league. 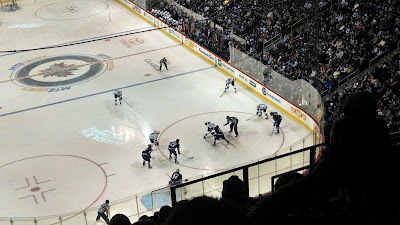 I never thought I'd get to go, but somehow my dad and I found cheap tickets at the last minute (official, not scalped, of course), and I got to see my first ever NHL game! We were way up in the nosebleeds, but I was impressed with how well I could see everything anyways. The arena's not so large that you can't see the action, even when it's at the other end of the rink, which is nice. What was less nice was how the Jets lost 3 seconds before going to overtime. Ah well. They made the playoffs last year regardless, and it's a new season now. If you look carefully, you can see #33, Dustin Byfuglien in front of the net. So, overall, I had a great time in Winnipeg. The museum was a good experience to get, The Forks was everything I was hoping it would be, and seeing the Jets was something that I'll never forget. As far as complaints about the museum go, some people have complained about how some certain issues are labeled or the fact that some things are or aren't included, but overall, I'd say that it's still a worthwhile experience. If you ever find yourself in Winnipeg, give it all a shot.